The clock’s ticking down to figure out what to give everyone this holiday season–and my stress level’s going up. 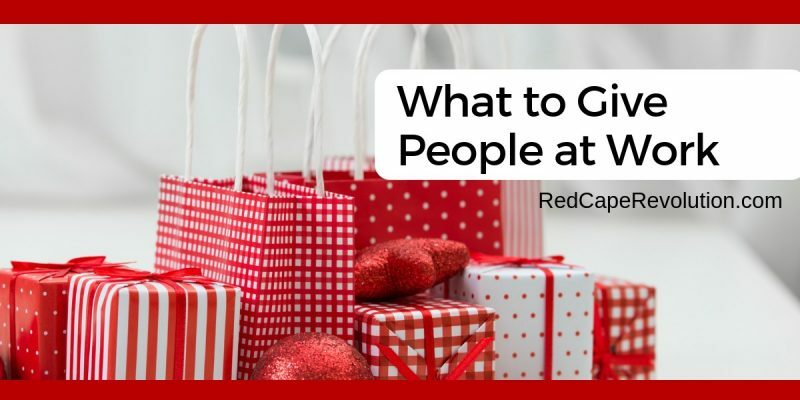 If you’re in the same tinseled boat, here are a few ideas that may kick up your gift-Q without deflating your money-Q. They’re all appropriate for the gift-worthy people at work, too. One of the best gifts anyone ever gave me at work was the commitment of their time in the year ahead. Knowing how busy this person was, it was one of the best presents I got. Promises are good, but easy to break. Make your commitment of time real by buying a gift card to your colleague’s favorite local restaurant, and booking two or three lunches on the new year calendar now. That way you both get out from behind your desk and into the real world. Plus, it’s easy: gift cards for a variety of brands are easily bought online or even in your local grocery store. Are you both job seeking or thinking about what’s next? How about giving them the gift of a LinkedIn profile swap, i.e., “I’ll show you mine if you show me yours”? Book a couple hours together in your local coffeeshop and the last person to finish a draft buys the next scone. In my work with clients, I often hear a longing to give back, but people don’t know where to start. If you’re hearing this from a friend, give them a gift of a day (or a few hours) of volunteering together. You do the hard work of figuring out the what and when, and you and your friend spend time together doing good work for a good cause. Of course, there are many other ways to gift your time to a colleague at work. If you’re not sure, there’s nothing wrong with asking them, too. If you’d like to give something more tangible, try these simple options. Since your camera is now in the same box of plastic where your phone and email live, you probably have (or can get) flattering photos of a colleague or friend at work or at a social event. Make those images into something they’ve never been: REAL. Put a great one in a simple frame to add some humanity to their drab taupe workstation. Chances are they never got around to making a hard copy of this memory, and might be pleasantly surprised to get one from you. No, hand-written notes and snail mail delivery are not out of style. In fact, they stand out more than ever. During the holidays, a few words of appreciation and good wishes help those we care about know that they matter. Who doesn’t need that kind of boost? Sure, you can send an ecard instead. If you’re going to do this, remember that personalization is powerful. Industry standard Hallmark.com has a great inventory of cards where you can add a photo or personal message, and many are free or at reasonable prices (including an inexpensive subscription to send as many ecards as you like). Another fave is JibJab, whose creations you may know from their political satire. They also have great free and paid video ecards you can create featuring the face of your friend. The point is, you’re better than the generic ecard. If your relationships matter, send them a thought that does, too. I don’t care how busy we get. Leaders are readers. Find my book recommendations for your favorite professionals here on my Book Club page. But don’t forget about that endangered species for readers: the magazine. Magazines continue to be valuable ways to keep up on our professions and the business world at large. Plus, this time of year, many magazines have discounted prices so they can document more readers to their advertiser base. Or, is your giftee thinking about change? Magazines are typically inexpensive ways to experiment with a new field or just to have some fun. Just search “[topic]+magazine” and you’ll find options you may have never heard of. Plus, you don’t have to be part of a profession or group to read as if you are. 5. For Those Worth a Little Bit More . . . If you’ve got a little more to spend for a person who’s equally important, consider buying them a membership in their professional trade association (like SHRM for human resource pros or IABC for communication types). Or, you could just cover their fees for a few meetings of your local chapter. Better yet, pay for both of you to go together. Now more than ever, trade associations are filling in the gap of creating professional communities and providing career connections. Belonging is a worthwhile investment. If you’re shopping for a spouse or significant other, maybe they need to get away for a weekend. One of my clients said this was the best gift she ever got, allowing her to relax and get her thoughts clear about what she wanted next in her work and life. Or, if that person you love has fallen out of love with his or her work, you might consider one of our courses or programs here. Helping someone start the new year with more clarity, confidence, and control over their life at work may be the gift that matters all year long. Posted in: Managing Your Career.